For more complete information on this unique rainforest plant, please see plant database file on caigua. Raintree’s caigua fruit has been sustainably wild-harvested in the Peruvian Amazon. To learn more about our rainforest ingredients and wild harvesting methods, please visite the plant database. This product contains no binders, fillers, or exipients and is 100% dried caigua fruit juice. This product is backed by Raintree’s Unconditional Guarantee. Raintree’s caigua is wild harvested—grown naturally in the Peruvian Amazon without any pesticides or fertilizers. 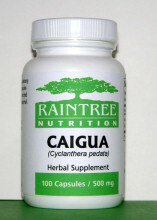 Ingredients: 100% pure caigua fruit (Cyclanthera pedata). Suggested Use: Take 2 capsules 2 – 3 times daily or as directed by a health care professional.